I've had fun at New Years in the past, but I'm usually somewhere very cold, drinking with friends + a bunch of inebriated people I don't know and by midnight I'm usually tired and all I want to do is find some late night food and my bed. It's always a good time, but just a little too over-hyped. It's always bittersweet — wow, that was fun.....but I expected more. This year was the opposite. Matt and I were both visiting our respective families for Christmas so we just wanted to be together. We made last minute dinner plans and decided that we wouldn't do the big hyped up party — just a late dinner and time to hangout after not seeing each other for two weeks. While I had geared up for a low-key evening, I couldn't have expected it would be this good. 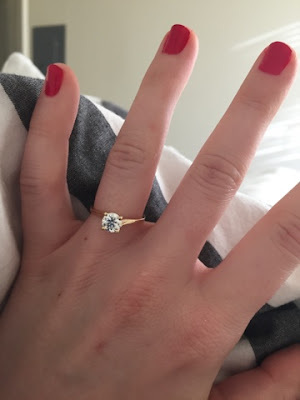 It wasn't a total surprise — we had looked at rings a few months ago and we've been talking about it for awhile. I figured it would be sometime in the New Year, but really wasn't anticipating it. After dinner we got home and it was thirty minutes until midnight. "I'll open some champagne," I said and headed into the kitchen. I turned around with the glasses and he was on one knee. It wasn't crazy, it wasn't over-hyped. It was us. Just us two, in love no matter where we are. Excited to start our lives together and see where it takes us. We don't have a date yet, but based on all that we have planned this year it will probably be sometime in the first part of next year. I'm hoping to do some DIY, which I'll share here, but I promise it won't become the #MulletMatrimony blog. But 2016 will be the year that Matt and Katy get together (and end long distance) so that's enough to look forward to for now.